With the Q2 2014 release version of UI for WPF, RadAutoCompleteBox provides a brand new HighlightBehavior feature. 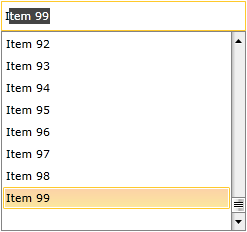 Now it is possible to choose which item of the filtered items by the RadAutoCompleteBox to be highlighted depending on a custom logic. The following example will demonstrate how to implement a custom HighlightBehavior that will always highlight the last matching item unless the entered text completely matches an item from the ItemsSource of RadAutoCompleteBox. 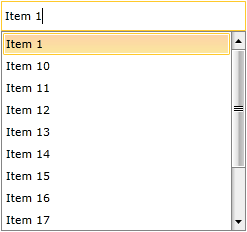 The ItemsSource should contain items of type Item with a Name property used as a DisplayMemberPath. If you don't want to highlight any of the filtered items you should return -1 in the FindHighlightedIndex() method. If the returned index from the FindHighlightedIndex() method goes out of range - no item will be highlighted (the index of the highlighted item will be set to -1). Figure 1: When there isn't exact match the last filtered item is highlighted. Figure 2: When there is exact match the matched item is highlighted.